Gone too soon! This exceptional stallion is proving to be a top progenitor even after his sudden and tragic death in 2014. Caches was a highly modern and athletic stallion who possessed exceptional movement through is body across the ground and over the jumps. His phenomenal pedigree does not fail through Cachas himself who had an excellent career up to his death. 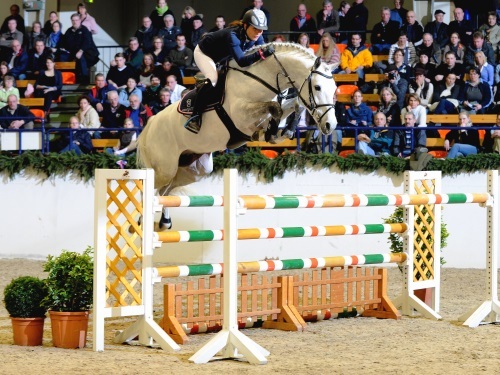 The 2010 competition season saw Cachas win 14 young show jumper classes at L and M level as well as the 6-year-old show jumper state championship qualifi er under Janne Friederike Meyer. At the Warendorf Bundeschampionat, Cachas qualifi ed for the fi nal by fi nishing 2nd in the first and winning the second qualifi er class. In 2011, the stallion successfully debuted at S level in youngster classes. He continued his success, capturing wins in jumper classes at S* level with his rider Janne Friederike Meyer. Cachas has also won several S level jumper classes under his new rider Thomas Konle in 2013. The offspring of Cachas are superb and he continues to lay down his legacy to this day by producing continuous premium/ champion foals and top notch jumping horses.